The CarbonCare® Label is a unique scheme. Since its launch in late 2011, over 300 labels have been awarded to listed companies, private companies, government departments, public bodies, social enterprises, NGOs, hotels, commercial buildings / venues and special events etc. The Scheme has evolved much to reflect and recognise the sustainability efforts of businesses and organisations. It is designed not only to prepare entities for the transition to the low-carbon economy, but also to reflect the tightened requirements of the HK Stock Exchange in ESG reporting. From 2018, applicants may choose either one or both of the two initiatives: entity-wide carbon management (CarbonCare® Label / CarbonCare® Champion Label), or best practice for ESG Reporting (CarbonCare® ESG Label). Each of the labels requires substantive effort to achieve, but all of them are a recognition of excellence in the journey to sustainability. In keeping with the widespread practice of environmental awards being supervised by value-driven, non-governmental organizations with a non-profit status, CarbonCare® labels are awarded by CarbonCare InnoLab under the supervision of an independent expert panel. Label certification service is provided by Carbon Care Asia. CarbonCare InnoLab (CCIL) is a non-profit organization dedicated to the nurturing and development of innovative solutions, policies and practices in response to today's climate change and sustainability challenges. CCIL is a charitable body registered in Hong Kong, enjoying tax exemption status under Section 88 of the Inland Revenue Ordinance. Carbon Care Asia is a social business which provides professional consultancies and other services through a market-based approach. The two organizations operate with independent governance structures, but share a common aim to promote a sustainable future. Both the CarbonCare® Label and the CarbonCare® Champion Label encourage and recognize the efforts of companies and organizations in their action to tackle climate change and achieve carbon reduction/neutrality status by Measuring, Reducing and Offsetting (MRO) their carbon footprints. (1) All organizations including listed companies, private companies, public bodies, social enterprises and NGOs are eligible to apply. (2) The entity must establish its emission baseline and emission inventory. Reduction and offset performance is validated and verified in accordance with a specific protocol based on international best practice before measurement. 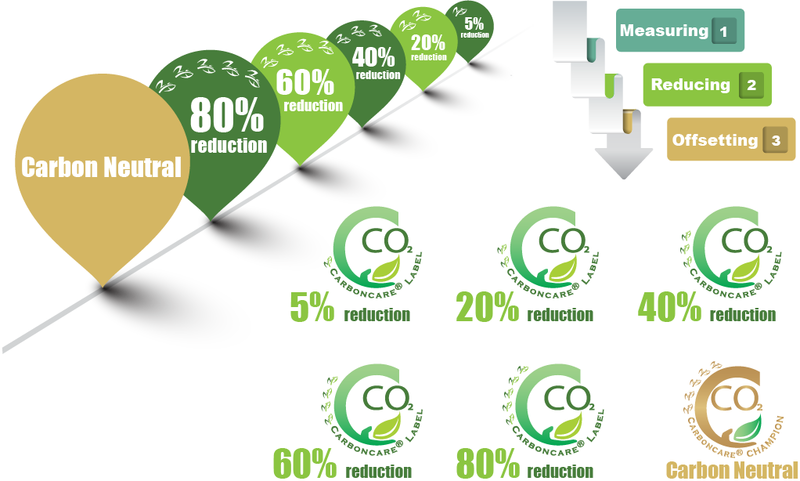 (3) There are six CarbonCare® Labels representing different levels of achievement in carbon reduction/neutrality – with green labels in one, two, three, four and five leave(s) respectively recognizing the achievement of 5% (starter), 20%, 40%, 60%, and 80% emissions in the application year against a defined base year, and a gold CarbonCare® Champion Label indicating the achievement of carbon neutrality. For committed achievers who have managed to attain the CarbonCare® Label or the CarbonCare® Champion Label continuously over a period of three years or more (including the year of label application), they will be awarded an additional CarbonCare® Star Label as a special recognition. Ever since the Hong Kong Exchanges and Clearing Limited (HKEX) has elevated ESG Reporting to “Comply or Explain” level from January 2016, investor expectations on the quality of disclosure have continued to increase. The HKEX analysis published in May 2018 has set the tone for good practice in ESG reporting. In 2018, the CarbonCare® ESG Label was upgraded to reflect the latest international trends, regulatory requirements and community aspirations. It was designed to give special recognition to the best performers in ESG reporting in three important areas: company board commitment, materiality analysis and disclosure of social KPIs. c. KPIs in at least 4 out of the 8 Social Aspects (B1 – B8) in the ESG Guide. (3) Three levels of recognition are awarded, dependent on the applicant’s achievements in one, two or three areas in (2) above. How can you benefit from a CarbonCare® Label? All awardees of the CarbonCare® Label will be invited to special events organized by CCA and CCIL, and will also enjoy the benefits of a special promotion package developed with our media partner. 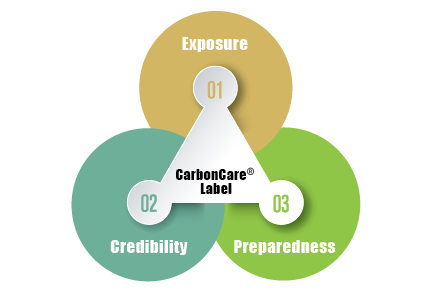 (5) Use of CarbonCare® Label logo on company letterheads, business cards, website and display areas.